Sweet and natural, corn should taste like it just came from the field. Use the freshest corn you can get and treat it gently. Whether you boil it or grill it, nothing beats fresh sweet corn in the summertime. Serve it with your favorite burger and your family will be pleased with this simple-to-make summer meal. 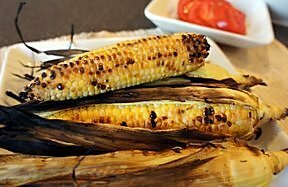 See step-by-step instructions on how grill sweet corn using several different methods. Would you like to enjoy the fresh taste of sweet corn throughout the year? See how easy it is to freeze sweet corn.